With Egyptian President Hosni Mubarak’s recent unwilling separation from power, we remember today how he got into power in the first place — for this was the execution date in 1982 for the assassins of his predecessor, Anwar Sadat. The murdered president inherited the office from the first name in pan-Arab nationalism, Gamal Abdel Nasser. Sadat led Egypt through the turbulent 1970s, fighting a war against Israel and then making peace with its Jewish neighbor to regain the Sinai, and generally proving himself more adept at the job than many had assumed. But the secular dictatorship was increasingly afflicted by that then-emerging, now-familiar specter, Islamic fundamentalism — specifically aggrieved by those Camp David Accords, but also confronting Sadat’s neoliberal economic realignment and political disaffection. Khalid Islambouli, the man who actually got Sadat, was a 26-year-old officer with an illicit affiliation to the Egyptian Islamic Jihad. At an October 6, 1981 military parade, Islambouli led an orchestrated hit, leaping from military vehicles to bombard the presidential dais with grenades and automatic weapon fire. Sadat was dead before he reached the hospital, and his office assumed by his vice president — Hosni Mubarak. Unsurprisingly, he played rough with the assassins. And Mubarak did … albeit carefully. Five self-proclaimed Muslim fundamentalists convicted of assassinating President Sadat of Egypt were executed at dawn today hours after their plea for mercy had been rejected by President Mubarak. The precaution was, perhaps, well-taken. Muslim fundamentalism would gain steam in Egypt during the years ahead, drawing a severe state response. 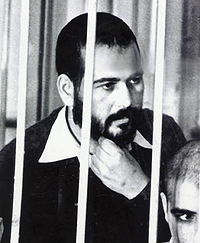 Islambouli’s younger brother Showqi almost accomplished an all-in-the-family twin killing by coming within a whisker’s breadth of assassinating Mubarak in 1995. The family name is still honored in the breach by other Muslim militants: there’s an “al-Islambouli Brigades of al-Qaeda” in Pakistan and an “al-Islambouli Brigades” in Chechnya.